Hi, my name is Doug and I would first of all like to thank you for taking the time to visit my website. In the following pages you’re not going to be faced with a site that’s full of annoying banner ads or pop-up screens. My only aim has been to let people know that kitchen faucets are more than just fixtures that sit in the background of what I think is the hub of your home. They can offer a certain something to the overall décor and at the same time make life easier around the kitchen. Before we get going, let me tell you about me (and I promise it will only take a few words). I’ve been in the kitchen remodelling and design business for many years, and decided it would be a good idea to set up a website where people can find the kitchen faucet they’ve always wanted. You will find some good, honest reviews about the various models of faucet I’ve decided to include, and I made sure to add some general information that you didn’t know before. So, onwards and upwards. Hopefully you’ll find a faucet that will suit you and your kitchen down to the ground! Whilst some people who visit my website are interested in what I have to say, I understand that some of you are just looking for a faucet – plain and simple. Perhaps you even have an idea of what type of kitchen faucet you need because you’re simply replacing one? It could even be that you’ve already done loads of research but you haven’t found the best model yet. Of course, I’ve also added information pages for those of you who are just starting your search and would like to know more about kitchen faucets. And in case you want to know more about installation, water usage or the options you have with kitchen faucets, make sure to check the general information section. If you’re looking for a bit of class (and a little secret that will make your friends green with envy), take a look at my review on the Delta Faucet 9178-AR-DST. I think this will compliment any modern or traditional kitchen and it comes in no less than 5 colors! For those of you who are looking for a no-nonsense kitchen faucet that gives you the flexibility of a pull out type, try taking a look at the Kraus KPF-2110. It’s very simplistic in design but it’s been built to last. Commercial style faucets are more and more finding their way to homes in the United States, and you do get a lot for your money with this type of faucet. If you really want to make a statement, the KPF-1602 is definitely worth checking out. 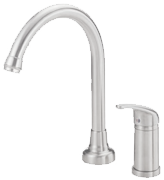 Now we’re really edging into the upper end of the market and if you want a kitchen faucet that will make life cleaner and jobs far quicker the Moen 7594ESRS Arbor is probably one of the most advanced on the market. As is my way, I want to make sure you get as much choice as possible and I know that not all of you will be looking for an integrated spray option with your kitchen faucet. So, I’ve chosen the Delta 4453-SS-DST as my favorite separate spray faucet for reasons that will become clear when you read the review. If you’re a bit of a traditionalist when it comes to the type of kitchen faucet you want, the two handle 21966LF-SS Dennison from Delta is a real eye opener. In my humble opinion this faucet combines modern technology with a timeless sense of style anyone would find attractive. Of course, the reviews above are based on my own personal preference, and I have made it as easy as possible for you to find the categories you would like to look at. However, I also thought it would be a great idea if you could go on a tour in pictures! You can take a look at some of the top sellers I have come across during my research, which I have ordered by type / style right. Just pick your favourite style and you’ll be taken to the section of your choice. There are plenty of images for you to feast your eyes on. I must say I’m constantly surprised at how people can become “over excited” at the prospect of installing an “all singing, all dancing” faucet in their kitchen without thinking about the practicalities. Just to help keep your feet on the ground, feel free to look at this section. It may surprise some of you, but I have come across customers over the years that are slightly confused about the difference between pull out and pull down faucets, so in this section you’ll finally find out! We all know what these are. It can be that annoying drip, a constant leak or your faucet just will not do what you want it to. Find out here what some of the more common problems are and how to combat them. These days we’re all concerned about how much water we use and for the most part this is down to expense. However, the more water you use the worse it is for the environment. If you want to find out more, take a look at what my research has revealed in this section. As you might have gathered by now, I’m all about making sure you get the best from your kitchen faucet, but I’m also about trying to help you save some money. In this section you’ll find some information on how to replace your existing faucet complete with a really easy to follow video – no need for a plumber! Yep, you’ve reached the end of my homepage and if you’ve read everything above, I salute you! I would just like to add that I hope you enjoy the following pages and even if you think a kitchen faucet is just a “kitchen faucet” you might be pleasantly surprised by some of the designs and types of technology there is available on the market. You never know, you might just find the kitchen faucet you’ve been searching for!